Troy Grove (population 305) is located in north-central Illinois in the northwest portion of La Salle County. U.S. Route 52 is the main roadway to and from Troy Grove. Interstate Highway 39 passes by about 1 mile to the east, while Illinois Route 251 passes by town about 2 miles to the west. The county roads of E. 4th Road and E. 5th Road also lead you to Troy Grove. The Chicago & Northwestern Railroad passes through the southeast side of Troy Grove. The Little Vermilion River passes by the southeast side of town as well. Troy Grove sits about 4 miles south and a little east of Mendota. A nice history of the town of Troy Grove can be viewed in a book found via Google search engine titled "History of Troy Grove Illinois in LaSalle County". Troy Grove School Inscription "Dist. 227"
The village of Troy Grove was first settled by pioneers heading west from the New York area. The first settlers began building their residences there in the early 1830s. The town was named by one of the original settlers (Warren Root) after the town he came from in New York called Troy. The word "Grove" was added to account for the vast grove of trees that adourned the area. Among the early settlers of Troy Grove included a man named William A. Hickok, a decon of the church and a man who opened the first store, who arrived in 1833. Mr. Hickok and his wife raised three sons, one of whom was named James B. Hickok. James was born in Troy Grove in 1837 and spent a portion of his youth there. James eventually set out on his own and became a well-known figure in the development of the "wild west" in the late 1800s. You may better know James as "Wild Bill Hickok" , ( http://www.answers.com/topic/wild-bill-hickok). A memorial designating the actual land on which stood the house where "Wild Bill" was born is available for viewing in Troy Grove (http://www.findagrave.com/cgi-bin/fg.cgi?GRid=479&page=gr). The history of the school system in Troy Grove is in need of research. We are confident that education was an important part of the early growth of the town. It was likely in the mid to late 1800s that some sort of schooling was established. We are not certain if any sort of high school courses were ever offered in Troy Grove. We only know there is an older high school building that appears to have been built in the 1920s. 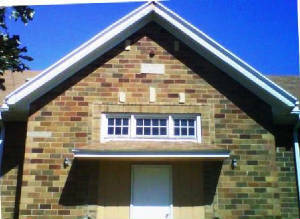 A gymnasium was attached at a later date. Due to the size of the town we believe that at some point Troy Grove may have offered one to three years of high school in the early 1900s. It is certain that the town supported a grade school, possibly grades K-8, at one time. 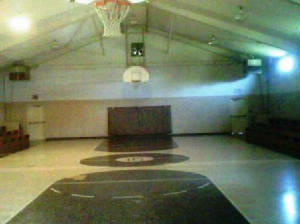 We do know that the Troy Grove school and gymnasium today serves as a community center. We believe the kids of Troy Grove attend school in nearby Mendota. If you have any information to support or refute the possibility that Troy Grove once supported a high school please contact us at eganann@sbcglobal.net.